Dr. Rasolkhani-Kalhorn produced a translation of the EMDR protocol in Farsi (Persian). In her dissertation she tells how she found psychologists in Iran to help with the translation, and to use the EMDR protocol in their field work in earthquake devastated regions of Iran. The psychologists also filled out a survey assessing the value of the translation, and use of EMDR in Iran. 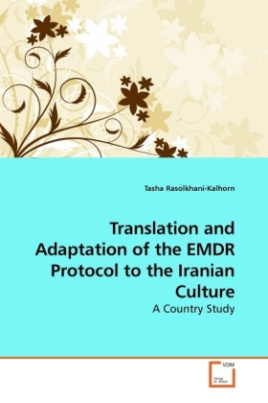 She considers the possible problems using the treatment in a foreign culture and shows how it could be incorporated through a country-wide effort to train EMDR therapists at the village level throughout Iran. The dissertation also includes a publication from the journal Traumatology outlining a theory of the neural basis of EMDR. This theory has since been proven correct through her research with two colleagues using EEG recordings of patients undergoing EMDR therapy.